A dreamy headboard can transform a yawn producing bedroom into a stylish sanctuary— and thanks to these 25 do-it-yourself projects, you don't have to go without this décor staple. Each idea will wake up a tired space without busting your budget. Even better, some of these projects take less than one hour to make. Elevate a plain IKEA headboard into a glitzy showstopper with this golden DIY by Sugar and Cloth. 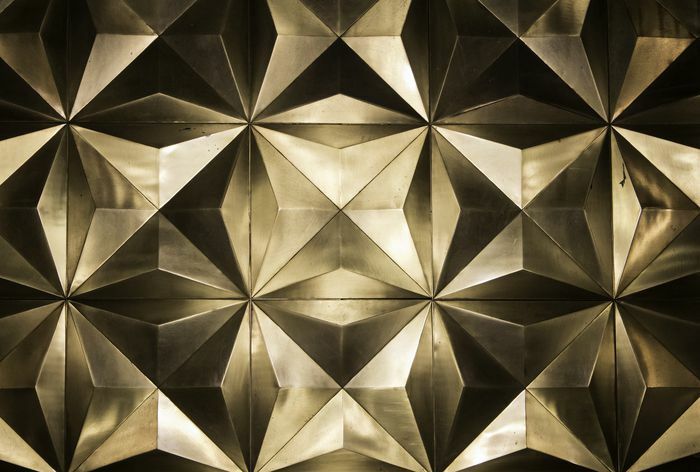 To get cracking, you'll need a roll of peel and stick metallic vinyl. Got a miter saw? It's the only power tool you'll need to build this gorgeous geometric wood headboard by I Spy DIY. Virtually any novice DIY'er can create this boho-inspired, natural fiber headboard by Sarah Sherman Samuel. To do it, just staple a couple of sets of matching jute placemats and table runners onto a wall and presto, new headboard. Here's an insanely easy and also super stylish headboard project from Brady at Style by Emily Henderson. It includes steps for creating a matching box spring cover. DIY newcomers rejoice! If you have $10 to spare you can make this cedar shingle headboard by East Coast Creative in a couple of hours. Minimalists and fans of Scandi décor will love this simple plywood headboard by Mr. Kate for its natural beauty. Don't have basic woodworking skills? No worries. It's a cinch to build using pre-cut lumber. Just look for a hardware store that offers wood cutting with lumber purchases. It takes less than an hour to paint a faux headboard just like this one by Paper & Stitch. To create a crisp rectangle, you'll need painter's tape. This no-sew upholstery project by Sarah M. Dorsey Designs uses four yards of fabric, 28 buttons, and around 250 brass nailheads to transform pieces of plywood into a chic, winged headboard. Cost including the foam stuffing? Around $140. Hey, dream weaver, if this gorgeous textile headboard by House Sparrow Nesting doesn't inspire you to macramé, nothing will. Here might be the easiest woodworking project on our list. The live edge headboard by Classy Clutter only took a couple of hours to complete. The best part? Sawing out an organic design as shown is much easier than cutting a perfectly straight line. If you think nothing is duller than neutral colors, you can spice up your bedroom with this graphic, headboard tutorial by Our Fifth House. To make, just map out your design on a pegboard with painter's tape before painting. Afterward, add a few pegboard organizers for storage. Give an old headboard a chic new life with this tufted tutorial by​ Cre8tive Designs. The no-sew project uses a staple gun to do the job. Creating a rustic headboard is as easy as a trip to your local home improvement center. The idea pictured here by Down to Earth Style uses dog ear fence pickets. The two clamp lights, which cost less than $10 each, add an industrial touch. Create a Lego-inspired headboard as shown by Sweet Parrish Place using paintable 3D wall tiles. Leftover tile from a bathroom renovation inspired this lovely boho headboard by A Designer at Home. A walnut stain brings out the plywood's natural beauty. This woven wood headboard by Little Bit Funky is insanely easy to make. After having the lumber cut to size at her local home improvement store, she wove the piece together and secured with wood glue. Rest your head while you're sitting up in bed thanks to this copper pipe headboard tutorial by Sarah Sherman Samuel. 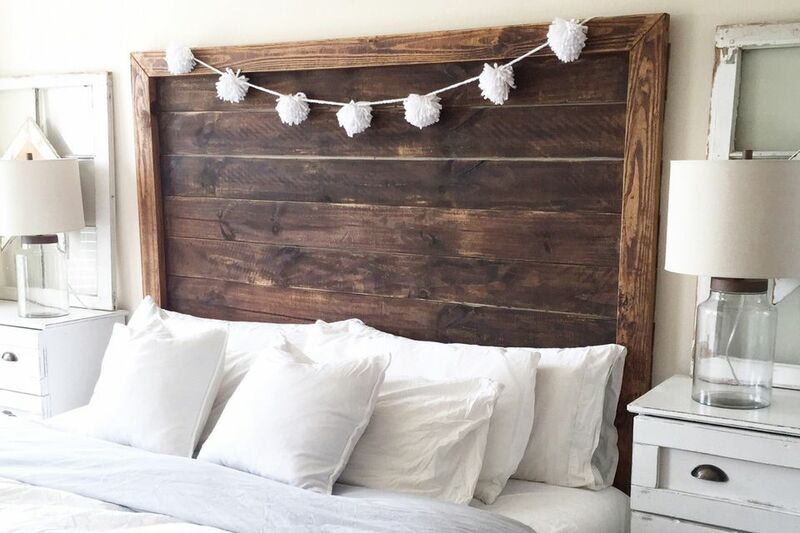 Master woodworker doesn't need to be a part of your do-it-yourself repertoire to make this farmhouse styled headboard by Lil' Luna. The blogger behind the project (a woodworking novice) was able to knock out the project in eight hours with her father's help. The project requires two power tools: A miter saw and drill. Don't throw out those vertical blinds! You can use them to make this woven headboard by Mad in Crafts. The ingenious blogger who created the project says retailers sell similar, but small versions of this headboard for around $700. However, her statement-making creation cost less than $70. Not bad eh? You can make this farmhouse-inspired ​king-size headboard by Deeply Distressed for less than 50 bucks. The do-it-yourselfer built this beauty using inexpensive pine boards. We love any project that reveals little known DIY tips. This diamond tufted headboard tutorial by Make, Bake, and Love includes a few doozies including how to poke holes in foam using a broom. It may be tough to believe, but it's 100 percent accurate: This elegant headboard by Flicker user Stacie is fabric wrapped cardboard.